No matter what you call it, stability ball exercises, exercises ball exercises or swiss ball exercises can be both fun and challenging. The stability ball can increase activation of the core muscles and increase your balance, strength, and coordination. 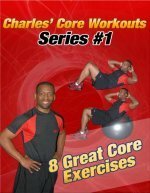 Below are 2 challenging exercise ball exercises that will work the abs, shoulders, and legs. These are advanced 1 leg versions of roll-ins and piques, so if you are a beginner try mastering 2 leg roll-ins and 2 leg piques first. Starting Position: Begin by placing your feet on a ball and your hands on the floor. Once you feel centered and balanced, lift one leg off the stability ball. Form: While keeping your abdominals engaged and your back stable, bring your knee in towards your chest and roll the ball forward. Hold just for a brief second and then straighten your knee and roll the ball back to the starting position. 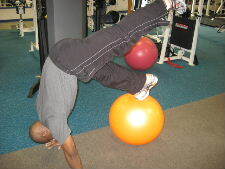 Personal Trainer Tips: During this exercise, the ball will have the tendency to move side to side, so you will have to use your core muscles to keep the ball stable. It is really important to engage your abdominals so that your back stays stable. If you feel your lower back arching excessively, pull in your abs, rest, or try the easier version of this exercise. Aim for 10-15 on each leg. 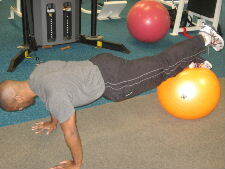 Form: While keeping your core engaged. Roll the ball towards your chest until you reach the pique position. Hold for a brief second and then slowly return to the starting position. Personal Trainer Tips: Try to get your hips pointing straight up to the ceiling, and as you return to the starting position make sure that you keep your abs engaged so that your back doesn't arch excessively. These are just 2 of many different stability ball exercises you can perform to work your core muscles. Since they are challenging, build up slowly and always listen to your body.